I've had several customers tell me that they love the Royal Elegance Necklace & Earrings in gold because of the boldly colored stones, but they would really like to have a silver set with brightly colored stones as well. Introducing--The Royal Elegance Special Edition Necklace & Earrings--Silver with Texture Changing Stones in Ruby, Lapis Lazuli, Green Turquoise, Amethyst, and Black Onyx. The LOW Sale Group is having a special sale this week--Only 4 Days--July 1 through July 4. 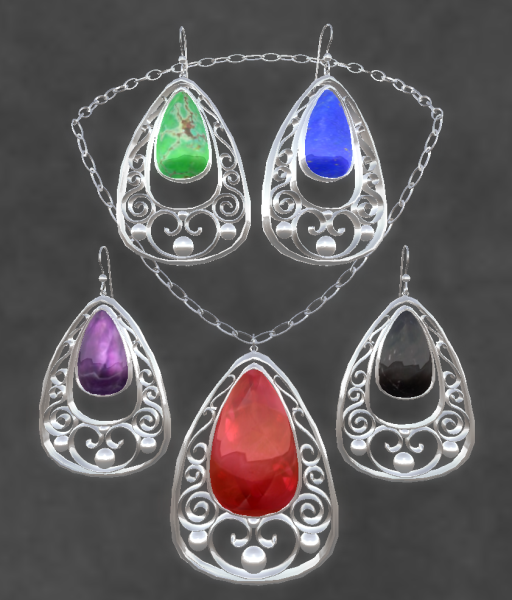 The Royal Elegance Special Edition set will be the featured item at Elemental Jewelry, priced at L$100 for the set--that's 60% off the regular price of L$250! Hair: Lillian from Truth Hair. Skin: Stella Di Roccia Tone C, Classic eye Crimson lip Skin from PixelDolls.